Whenever you’re offered videos where the bad guys are the trilogy of Jewish bankers, Freemasons, & Bolsheviks, you ought to smell the foul odor of anti-Semitism. The Illuminati crap is soon to follow. The whole world becomes their conspiracy requiring no deeper understanding–& treating the human race as nothing but sheep & goats led to slaughter. Flee from that theory like the plague. 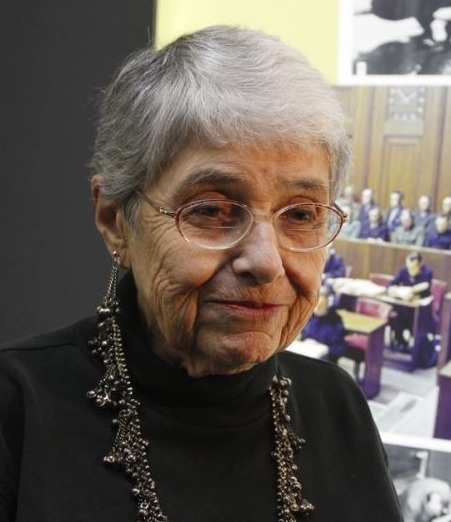 Hedy Epstein, a 91-year-old Jewish holocaust survivor, was invited & slated to be honored by the Austrian parliament at a March event titled “In Grandmother’s Words…The Fate of Women in the Second World War”. Epstein fled persecution in Germany in 1939 at the age of 15 & eventually ended up living in the US, including NYC, Minneapolis, & now St. Louis, Missouri. She is a long-time activist for affordable housing, reproductive rights, anti-war, & was arrested in St. Louis protesting in solidarity with the Black community of Ferguson after the murder of Michael Brown in 2014. She became a supporter of Palestinian rights in 1982 after the massacres at the Sabra & Shatila Palestinian refugee camps in Lebanon which the Israeli military was involved in. She is an active member of Palestinian solidarity as a speaker & an agitator–as an anti-Zionist who rejects a Jewish-only state & promotes a democratic secular state; supports the economic & cultural boycott (BDS) of Israel; & she was a participant in the 2011 Gaza Freedom Flotilla to break Israel’s naval blockade of Gaza & deliver humanitarian aid & solidarity. Today, a spokeswoman for the Austrian parliament informed the Jerusalem Post that the event honoring Epstein has been canceled “in consideration for the concerns against some of the participants.” The Zionist ideologues who vilified her lauded the Austrian parliament for their speedy capitulation to political pressure. 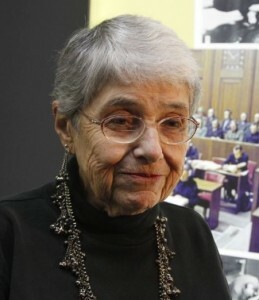 It’s of course an outrage that the Austrian parliament folded without even putting up a fight but it really isn’t the appropriate venue to honor a person of the political stature & dignity of Hedy Epstein. The Austrian government has set limits on the number of refugees it will allow to enter the country; it’s using the army to stop refugees from transiting through to Germany; it’s busing refugees back to the border & stepping up deportations; it’s offering refugees chump change to go home (€500); & it’s urging Austrians to create vigilante militias to patrol the border against refugees. Hedy Epstein is a remarkable, tough-minded woman who does not rely on honorifics to do the right thing. She’ll put the affront behind her by dinnertime tonight. But we should take a moment to honor her & to let her know those who stand with refugees, with Palestinians & against Israeli apartheid, for women’s rights, Black civil rights, against war, consider her one of our most honored & respected teachers. May she inspire all of us to live as admirably as she does. May her life be long. Media seems to be exercising discretion about what conditions those “tightened rules” impose on refugees. Such discretion represents deceit & unwillingness to disclose the full extent of EU violations of international law governing treatment of refugees. So far, we know Denmark & Switzerland have legalized stealing the property of refugees when they apply for asylum; those granted asylum in Germany will be blocked for two years from bringing their families to join them; Germany has designated Algeria, Morocco, & Tunisia as “safe countries of origin” & refugees from those countries will be denied asylum, though they are also denying asylum to Iraqis coming from a US war zone; Sweden, Norway, & Finland announced they will deport tens of thousands of asylum seekers. In all of the EU countries, those who do not leave voluntarily will be deported. The unstated part of these new “tightened rules” is a news blackout so the world doesn’t know the full extent of the criminality–most importantly, the number of refugees who continue to drown crossing the Mediterranean despite NATO & FRONTEX naval fleets prowling the entire sea. According to the International Organization for Migration (an intergovernmental agency), nearly 4,000 people drowned last year. The IOM also reports that so far in 2016, 321 have died on the Turkey to Greece route & 90 have died crossing from north Africa to Italy & Spain. Their figures don’t correspond to those from the UN refugee agency (UNHCR) & it’s likely both are underestimates of the number who have died. 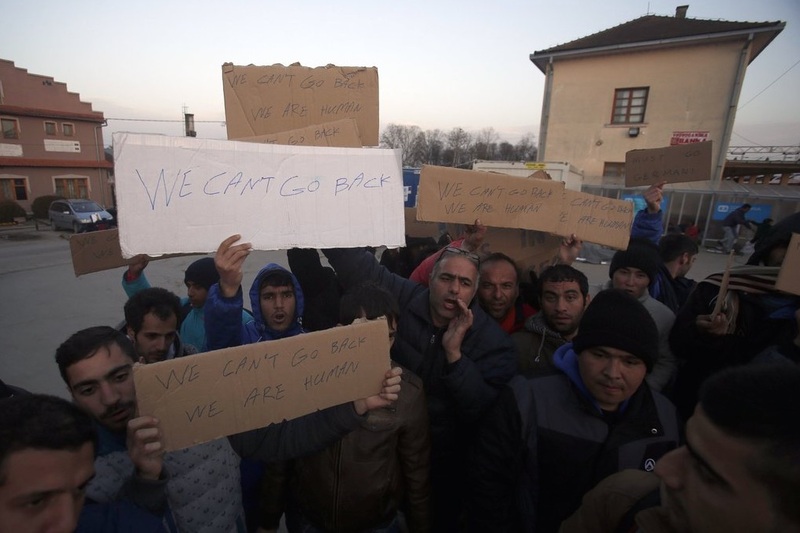 There can be no overestimation of the amount of human suffering being inflicted by EU immigration & refugee policies. Imagine that refugees fleeing war zones & massive bombing have to stand behind razor wire barricades with signs saying “We can’t go back. We are human”? No one who came of age politically in the post WWII period of anti-colonial & civil rights struggles ever anticipated that the gains of those momentous struggles would be reversed so dramatically. It is the historic imperative of our period to again stand together against the advance of barbarism. That means rebuilding the international antiwar movement & demanding immigration as a human right. Open the damn borders.